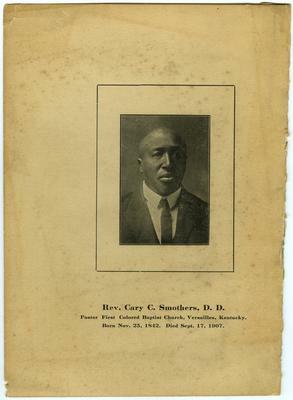 Reverend Cary C. Smothers, D. D. (1842-1907) pastor of the First Colored Baptist Church, Versailles, Kentucky; printed on front "Rev. Cary C. Smothers, D. D. \\ Pastor First Colored Baptist Church, Versailles, Kentucky. \\ Born Nov. 25, 1842. Died Sept. 17, 1907."